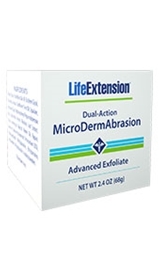 Unlike harsh, irregular particles in facial scrubs or aluminum oxide used in other exfoliates, Dual-Action MicroDermAbrasion Advanced Exfoliate contains advanced spherical-shaped silica particles (aluminum-free), providing uniform exfoliation that is highly effective at removing dead, dull skin cells to reveal the younger-looking new skin below. Restorative antioxidants in Dual-Action MicroDermAbrasion Advanced Exfoliate then quickly penetrate the upper levels of the epidermal layer of the skin, accelerating the skin’s natural renewal process. Rather than just relying on mechanical abrasion, Dual-Action MicroDermAbrasion Advanced Exfoliate contains the Linked-Papain C-MPB antiaging enzyme to provide dual-action exfoliation. Unlike the irritation that often occurs with other chemical peels like alpha-hydroxy acids (AHA), the Linked-Papain C-MPB "softens" and digests proteins only in the stratum corneum layer of the skin, stimulating protein synthesis and repair. Even though the Linked-Papain C-MPB is a highly effective enzymatic peel, it is no more irritating than pure water! This product is unique in that it provides advanced avenanthramides (compounds found in oats known for their anti-inflammatory action) that soothe and protect new skin that can become naturally irritated by abrasion or being exposed to the environment. Water, silica, emulsifying wax NF, butylene glycol, sunflower oil, squalane, pentylene glycol, dihydroavenanthramide D, Aspalathus linearis leaf extract, Prunus armeniaca (apricot) kernel oil, papain, carbomer, sodium hyaluronate, tetrasodium, EDTA, phenoxyethanol, methylparaben, ethylparaben, butylparaben, propylparaben, isobutylparaben. Using fingertips, apply to moistened skin. Using a rotary motion, gently massage for 15-20 seconds. Rinse thoroughly with water and pat dry. Discontinue use if redness or irritation occurs. Test in a small area before using on entire face. Use sparingly and only as often as needed. Dark speckles are a natural characteristic of the product.